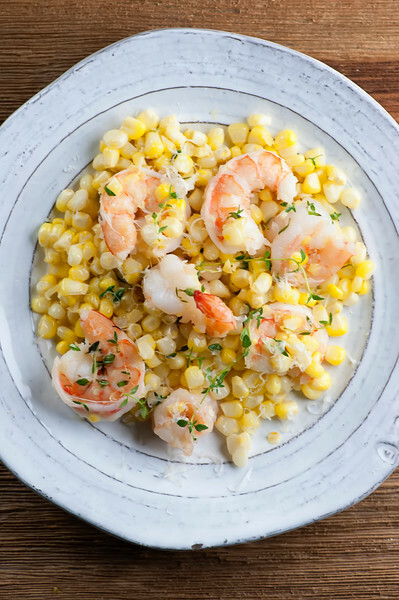 This easy recipe for shrimp with corn and herbs is the perfect end of summer supper! And it’s ready in 10 minutes – what could be better? So pick up some shrimp and some local corn and get ready for the compliments to the cook. It’s the last day of August (sniffle!) and the corn is as high as an elephant’s eye, as they say. Everywhere I turn I see signs for sweet local corn, and so I am in major league use-it-or-lose-it mode. Same with the herbs growing merrily in my whiskey barrels, oblivious to the fact that frost is right around the corner. So hang on to these last warm days of summer with my by making one of my easiest, most summery, most beloved recipes, which is shrimp with corn and herbs. Four ingredients. Ten minutes. Total supper happiness. Let’s make it! 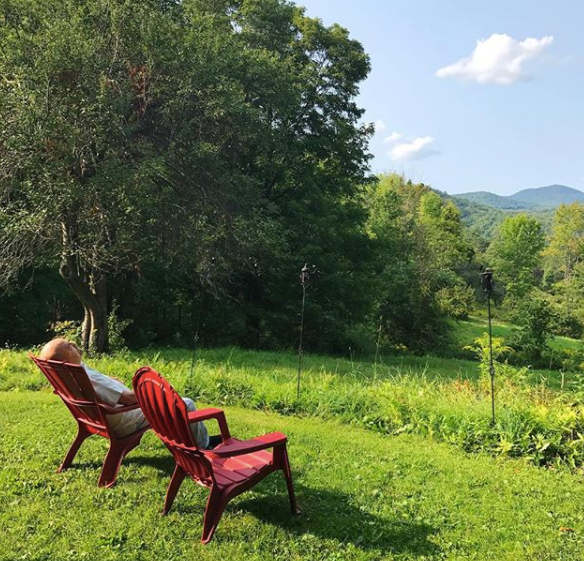 I’m even more attuned to the corn than usual these days, because as I type the Southern husband and I are in one of our most favorite places on earth, my beloved Vermont. 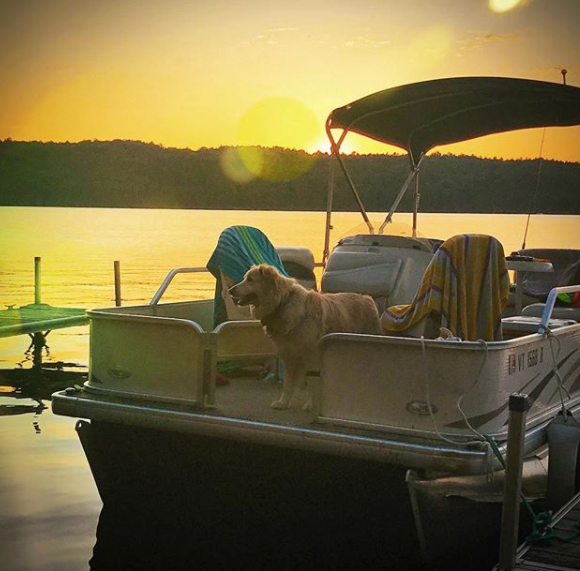 We drove up to our cozy cabin, dropped our bags, and the Southern husband made a beeline for the nearest Adirondack chair. Because as one of my friends reminded me when I posted this picture, unpacking is over-rated. Unless you are unpacking this. 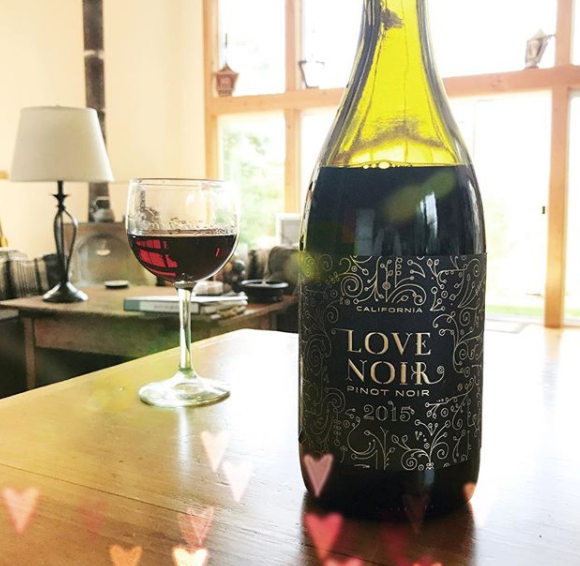 An open bottle of Pinor Noir on the cabin kitchen counter is a beautiful, beautiful thing. We clinked our glasses together to the sound of some cows moo-ing in the distance and not much else. This is the one week of the year when I do absolutely no cooking. Instead we have all the great local delicacies Vermont has to offer, starting by eating the best bacon egg and cheese sandwich on the PLANET at Sissy’s Kitchen. If you are ever in Middletown Springs, Vermont, do not miss it. It’s on my top five list of the best things I have ever eaten. 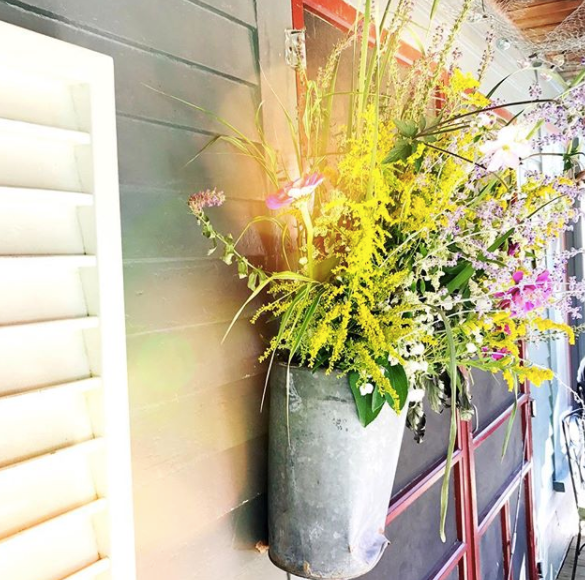 Plus Sissy has a front porch with wildflowers spilling out of old tin buckets, and dogs lounging around the front steps. Meanwhile, getting to any of our favorite Vermont watering holes involves driving at least a half hour along field after field of glorious, fully grown corn, which brings me back to the wonder that this shrimp with corn and herbs. All you do is saute up some peeled and butterflied shrimp with some fresh corn, a little butter, your choice of fresh chopped herbs (I’ve made this with thyme, basil and even mint) and voila! Perfect, glorious, simple summertime deliciousness. Have a glass of wine with it and eat outside, and enjoy these last lazy hazy days! 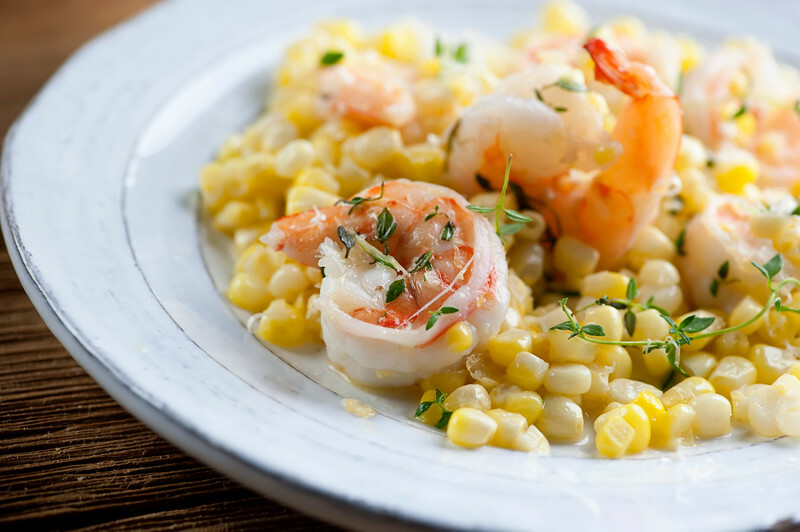 This easy recipe for shrimp with corn and herbs is the perfect end of summer supper! And it’s ready in 10 minutes – what could be better? This dish is perfect as is, but if the mood strikes me I have been known to mix in some crumbled feta cheese, or to grate some fresh Parmesan on top. You should experiment, too! I’m so glad that you heeded my advice and let the luggage chill while you guys did too:)!! What a glorious week for you both ! And .. here…headed to the farmers market for corn this weekend.. what a perfect recipe! We are experiencing very hot weather 100 plus plus every day. Quick, and easy recipe that looks amazing. Enjoy the rest of your week and have an egg sa which for me! This sounds so idyllic, what a great time you had. And concerning the recipe I love the mention of using really good butter, it really makes such a difference, doesn’t it? Especially when it comes to such simple recipes using only few ingredients. I would love to try this!